We know that you choose your gifts with care. We want to help you present someone special with a gift that is naturally simple and simply soothing. Something that is thoughtful and memorable. Something simple that is made with care to reflect the care you have for others. Basket of Pamomile soaps ready to be tucked into hospitality bags and delivered to out-of-town wedding guests. 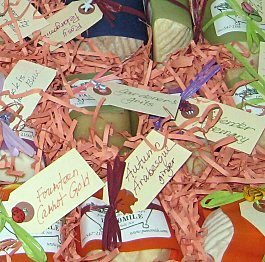 Please contact us to see how we can tailor a basket or "year of soap" or even party or special event favors for the special people in your life. We will customize your gifts to your specifications. We are also happy to offer lovely GIFT CERTIFICATES if you choose. They are presented on a unique Pamomile note card. 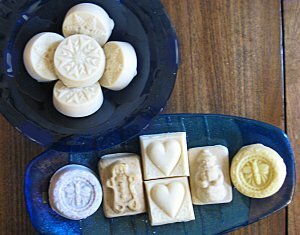 A YEAR OF SOAP: Let Pamomile select twelve lovely, specialty soaps presented in a charming gift box with a gift card enclosure. 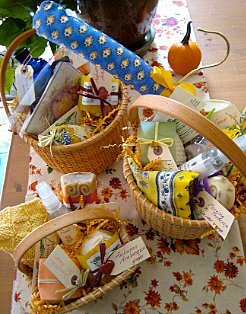 GIFT BASKETS: An assortment of our soaps, spa products, and/or laundry aids presented in a charming basket. Perfect for birthdays or as a gift to a new mother or even a housewarming gift when staying with friends. Priced according to contents. 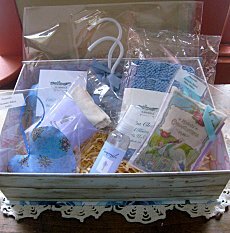 BASKET for BABY: The perfect shower gift or special present for baby and the new mother, this gift selection of PAMOMILE products can be presented in a gender-specific gift box. Included in the box are: a set of nursery hangers, a petite pillow for the nursery to hang on the door/drawer knob, a sweet heart sachet, a mister, a USA cotton cloth for baby's bath, and a bundle of dryer sachets. Tuck in a baby toy as your personal touch. SPECIAL OCCASION/EVENT FAVORS: Pamomile’s unique handmade products would make unique favors for your special occasions: shower gifts, dinner party gifts, any special event. Also, Pamomile items provide thoughtful content inclusions for your event hospitality bags.